This posting is a compilation of postings by several pilots. Most all of the material in this posting was copied from threads posted on the Hollister (hgcgroup) pages at yahoogroups.com Copied from the hgcgroup pages and posted on this VSA page by VSA web page manager, Peter Kelly. The pilots flying were Buzz Graves and Ramy Yanetz – and each pilot provide their initial report to their fellow pilots. The weekend they are referencing is 13 and 14 July 2013. 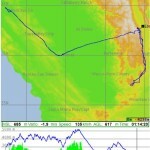 The first article ( in two parts) was written by the pilot – Buzz Graves, call sign BG, flying a DG800 motor glider, and posted on Tue Jul 16, 2013 12:30 am (PDT) . The second article was written by the pilot – Ramy Yanetz, flying an ASW27 glider, and posted on Mon Jul 15, 2013 6:44 pm (PDT). hours, so I could start another 60 hour work week Monday morning at 7 am. and Bishop. Some real-time info in the air left Inyokern a big maybe. battery is low. Glide ratio is space shuttle like, 95 knots with a 1:1 L/D. Avenal with also backtracking to the south. way I found a bit more and experienced a super tail wind and friendly air. Hollister ground organizing help for TG. How to (not) turn an epic flight to a bust. I am writing this essay to help myself cope with my mistakes (way too many this year) which many of them has something in common, which other can learn from as well. describing the convergence line to be “way east toward the San Banito MW tower, and that it was bad to the west. . As it turned out, it was only couple of miles east and in direct line to EL5. Which is quiet normal, so long story short, once I lost my line I assume I went too far west and started bee lining to the MW tower at the east end of the San Benitos. Very stupid decision from two fundamental reasons: It is rarely good at this direction, and the dust was blowing from the east down below, (although from the SSW at altitude). Also no dust devils at this direction (or any direction). 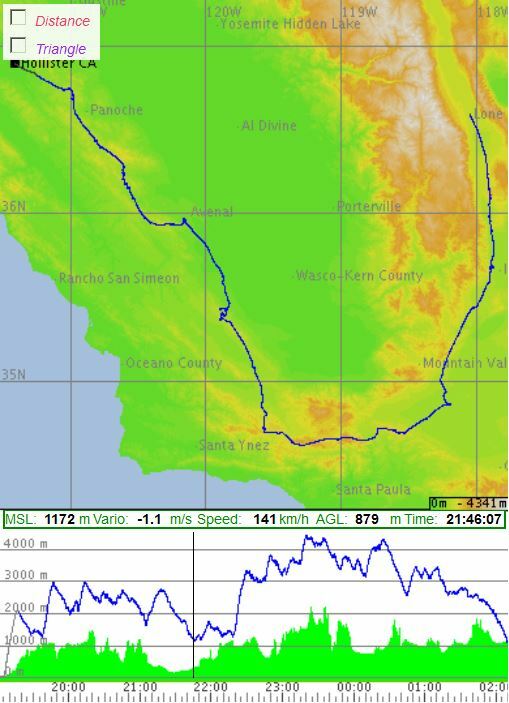 By the time I realized my mistakes I was too low to move far enough west to connect, and ended up scratching low for an hour over Harris ranch in weak lift and landed Coalinga for an expensive aero retrieve. 1 – Should have used common sense and experience to find the convergence line as Buzz did to make it home and complete an epic flight. 2 – Should have used ground clues which were showing NE wind although SW at altitude, which means move further west. 3 – Should take other pilots reports, especially those who flew an hour earlier from a different route, with a grain of salt, or completely ignore them and maybe turn the radio volume down and fly my own flight. 4 – Don’t push yourself in a corner. After loosing few thousand feet in a convergence, you obviously lost is, so move towards where is is normally expected to maximize your chance.Use wind clues. However there is one more conclusion, or perhaps a plea, for other pilots. If you do provide tips, PLEASE be more accurate. “Way to the east” will not do. As it turned out, way to the east meant heading to EL5 instead of Center, which is barely east of the line. Instead use distance and direction from landmarks/waypoints. When flying in unmarked convergence, couple of miles to west or east will make all the difference in the world, as I learned the hard way. And to end on a positive note, it does not matter how many years and thousands hours of experience you have, we still live and learn from our mistakes. I am hoping this essay will help me and other be better pilots.